“You committed to doing what?” My husband had that look on his face where he scrunches his forehead down into his eyes because he’s confused. I watched as his eyes rolled up in his head, doing a little mental math. “And we may be traveling a couple of those days,” he added. “Ha! I got you on that one. 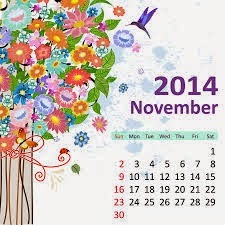 My blog is ready for November. 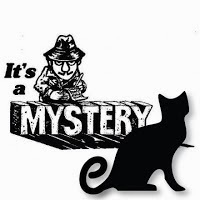 It’s the month I dedicated to studying how to write a mystery or suspense novel. and a fun little piece I’m calling The Final Exam” the day before Thanksgiving. But it is true. I registered for NaNoWriMo. 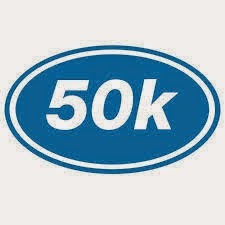 Though the timing is right to pursue my next project, I actually have ulterior motives. First, “winners” of NaNoWriMo (those meeting their 50K goal) have a chance to purchase Scrivener (software for writers) for 50% off its normal purchase price. I want that. Second, I want to write something of a romance novel. Don’t roll your eyes. I have a very good reason for this. My other works have been written from a single point of view. I want to stretch myself. A romance novel is generally written from two points of view…the man and woman involved in the story. Hang on….this is leading to the mystery/suspense writing. If you are interested in giving a shot at writing that great story you’ve always had in mind to put to paper, it isn’t too late to join NaNoWriMo—just Google it. But if you want to start by trying your hand a short mystery piece, join me on this blog, A Novel Creation for the month of November. I think mystery writing takes a special touch. I’ve done a bit of reading and exploring and I’m anxious to share “Whodunit University” with you beginning next week. Don’t keep me in suspense…in the comment section below, share your ideas for ways to improve your craft and stretch yourself as a writer. 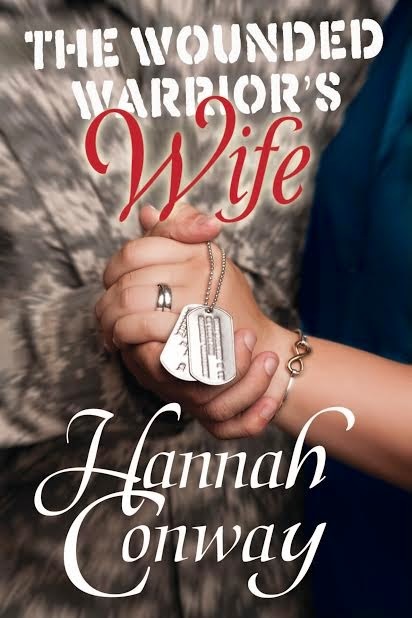 In September, Hannah Conway released her debut novel, The Wounded Warrior's Wife. I asked her to share a bit about the book with you and to take us a step closer to her main character, Whitleigh Cromwell. Read the post below and be sure to comment…you could win a copy of The Wounded Warrior's Wife for your eReader or a $10.00 Amazon Gift card. You must leave a comment to be eligible to win. My debut novel, The Wounded Warrior’s Wife, debuted in September. What a blessing it’s been to be on various blogs and get to meet so many wonderful readers. So much love and support! This novel has many deep, heavy themes, but I worked to lighten the mood by intertwining scenes that display some of my character’s talents and abilities. For example, my main character, Whitleigh Cromwell—a young Army wife, has quite the crafty knack for refurbishing and repurposing various items. Others notice her ability and she finds herself using mason jars to help create centerpieces for military events. Whitleigh’s talent intrigued me, so I began to look up other Mason jar crafts she might be interested in and there it was—a Mason Jar Tumbler. I dove into a different aspect of Character development and decided to create something my character would love to create. Ya’ll it was such a blast that I’m here to share with you how to make one for yourself or a friend. Whitleigh Cromwell would be proud! · Straws: I bought BPA Free Plastic Straws from here. · Rubber Grommets: These are harder to find, AND you will need to buy your straws BEFORE you buy the grommets. Take your straw with you when grommet shopping at Lowes or Home Depot. I bought the 3/8 of an inch grommet for this project, but you could need another size. Grommets will be in the specialty section in the screws and rubber stopper area. Ask for help...I had to! They are fairly cheap no more than a dollar for each and if you’re lucky, sometimes they are two for a dollar and some change. · Mason Jars with lid: You can find these at Walmart, Target, Rural King, Tractor Supply, online etc. Any size will do, but I REALLY like the bigger size jars. · Drill or Dremell tool: You want to use a bit that is a little bigger than the straw. · Old Scrap Wood: This will be used to lay the lid on when you drill. · Marker: Sharpies work just fine. · Protective Eye Wear: Glasses and sunglasses should suffice, but you can get a cheap pair of safety glasses for a dollar or two. It’s better to be safe than end up with Mason jar-lid metal in your eye. · Any ribbon/décor etc you’d like to tie around lid (optional). · Any tea or drink mixes you’d like to place in the jar for a gift (optional). Cost: $1.50-$3.00 per jar/makes 8/use the other 4 remaining Mason jars for other awesome crafts! 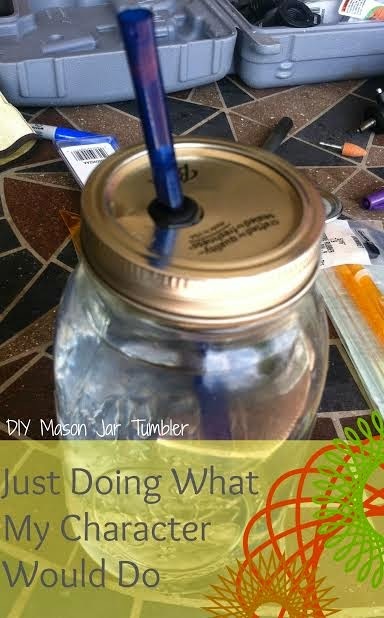 · Take the lid and ring off the Mason jars you will be using. · Make a small x or mark with a marker at the place on the flat, round lid where you want the straw to be. Some choose the middle, but I marked mine off to the side. · Put your safety glasses on. Lay the round, metal lid on the piece of scrap wood and drill your hole on the x/mark. At this time, some people will use the sanding tool on their Dremel tool to smooth out the metal drill hole. I have done this both ways—sanded and unsanded—and either is fine. · Put the grommet on the straw and work it in place on the hole. The grommet has two lips so that each side of the metal hole of the Mason jar lid will be sealed by the grommet once it’s in place. · At this point you can put tea packets and drink mixes in the jar if you’d like. Then put the lid along with straw into place, screw the lid on with the metal Mason jar ring, WHAAA—LAA! You’ve got a Mason Jar Tumbler! · At this point you may decorate your jar. · Remember to wash the cup and straw before drinking out of it. If you’re like me and need a visual on a DIY, here’s a video that I found very helpful when preparing to make my Mason jar tumbler and I hope you will too! Click here for the video tutorial. I hope you’ve enjoyed this little twist on developing your character. I wonder…what would your character create? I’d love to hear the wonderful talents your characters have and let me know if you found the time to make a Mason jar tumbler for yourself or a friend. Stop by my pinterest page for The Wounded Warrior’s Wife when you get a chance for more ideas and photos inspired by The Wounded Warrior’s Wife. Be sure to grab a copy of the novel here to journey along with Whitleigh Cromwell as she learns about love, life, forgiveness, and restoration through God’s power. The Wounded Warrior’s Wife can also be found at Barnes & Noble, Books A Million, Googleplay, and iTunes. 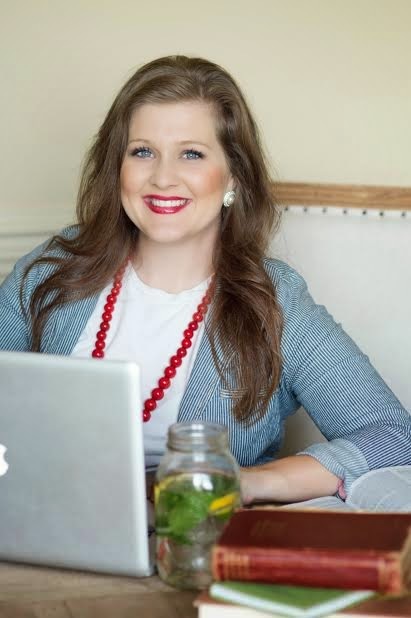 Hannah Conway, a Kentucky native, Army Wife, Stay at Home Mother of two, and Speaker, lives in Clarksville, TN near Fort Campbell, KY where she and her family are currently stationed. Hannah holds a BA in History from the University of Colorado at Colorado Springs, is an active member of the American Christian Fiction Writers and My Book Therapy. "Thars Gold in Them Thar Reviews"
Word of mouth. That’s it. 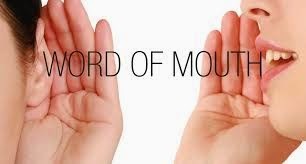 Ask any marketing guru and he or she will tell you that word of mouth is the main source on which people rely to locate a product or service they want. That’s why Angie’s List is popular to locate a home service. It’s why Consumer Reports is a widely used magazine for people looking to buy a car or computer. Angie’s List and Consumer Reports are the 21st century’s answer to over-the-fence neighbor-to-neighbor talk of yesteryear. So how about books? Same thing: Word of mouth. A friend reads a great book and tells me about it. My daughter tells me to not waste my money on the latest trilogy. My mom gives me a call and says she just read a wonderful book. All readers I trust, so I listen. Reviews for books are the new over-the-fence word-of-mouth recommendation for a good read. Well, not all that new. We’ve been reading book reviews in newspapers for quite some time. We learned how to write them in eighth grade. But online reviews, reviews and ratings posted on accessible sites such as Amazon or Goodreads, are relatively new. And the best part is that everyone is invited to post a review. Your voice has the chance to be heard (read) by millions of people. People wondering if the book they are considering is worth the time and money. Sounds easy enough. I go to Amazon or Goodreads, type in the title of a book I've read. I rate it by clicking on the number of stars I want, post my comments, and voila! I’ve reviewed a book. My three or four sentences may help another reader make a good choice. I know they will help the author. Reviews are like gold to authors. Even if the review is not glowing, its presence shouts, “Somebody actually read this book!” Authors feed on that affirmation. Well, to get the picture of your book to show up there, you need reviews. Some say ten, others say more. As an author, you want to go into a bookstore to ask them to carry your book? You need reviews. Your local news wants to see if you’re newsworthy? They’ll look at your reviews. Reviews are like gold. And they’re easy to do. So why don’t more people write them? Why don’t you? · At the end of that section on the first page you will see a small gray box with the words “Write a Customer Review” in it. · Click on that box and follow the directions. “Easy Peasy,” as my grandson would say. And writing a review on Goodreads is even easier! 2. I don’t know if I could write a big, fancy review. Good. I don’t want a big, fancy review. I want an honest review by a regular sort of person like me. Three or four sentences? Totally fine. Of course you can write more if you have more to say, but keep it simple. You’re not there to impress anyone. Your job is to inform. 4. I didn’t like it and I don’t want to be mean. Interestingly enough, I don’t want you to be mean either. Honest? Yes. Mean? No. Respectful? Yes. Mean? No. So you didn’t like the book. Not everyone likes everything. Be honest, but be specific. “I didn’t like the book because it didn’t have vulgar language and I think that would have made it more realistic.” Okay. 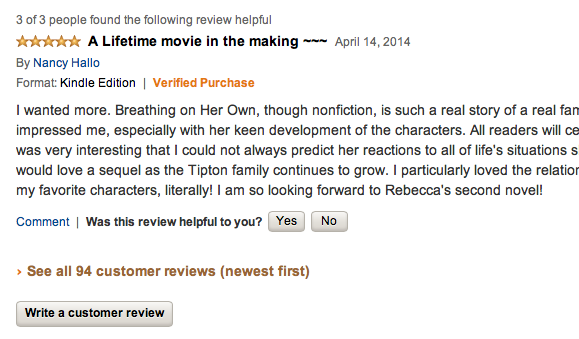 The next person reading your review may be looking for a clean read and buy the book. Or the next one may think as you do and pass over it. Your comment was helpful to readers. That particular comment wouldn’t change what I do or say but another might. I’m not going to throw foul language in my books to make them sell, but if reviewers commented on something I could/should consider changing, I’ll listen. My publisher says a hundred reviews is like gold. I don’t know what happens on Amazon when I reach 100. I don’t know if my publisher will notice and smile. I only know that I am only six reviews away from finding out…and I’m throwing a party! A word about Goodreads: You can rate and review books you read ten years ago. You can engage in discussions with authors, join book clubs, and enter contests. Goodreads is like a big, interactive, online book club. As a reader, do reviews influence your decision to buy a book?